Several years ago I got a bargin at a yard sale, a f/5 10" Coast Instrument, Trecker Scope Newt., fiberglass white tube, 8x50 WW2 grey right angle finder scope, on a heavy EQ. Mt. Inquring about it, I was told that it was from the 50s, and used to be considered a top notch reflector in it's day. Are many of these still around? What ever happened to Coast Instrument Co? My scope looks Exactly like a modern day Parks, right down to the grey pier type motor drive EQ. mount on rubber wheels. Wonder if that's just a coincidence? The two eyepieces, and 3x Barlow, are heavy MgF coated, and the imaging is super! 10' Trecker Scope Newt., 8x30W Swarovski, 7x50 USN B&L, 7X50 Hensoldt, and 11x80 Meade-Japanese-five pound brute! I have seen copies of their full page ads scanned on the web. I will see if I can relocate. They were short lived, and as their product line was remarkably close to Cave's, and they were physically located near each other, makes me speculate they were an offshoot. From time to time one shows up on eBay. There is a rumor that Parks bought Cave's castings, hence the simularity of the mounts. Thank's for that Info. Doug! Some time ago I was told that my Trecker Scope was from the 50s, but if Coast Instruments was still operating, say, into the 80s?...it may indeed be a lot newer than I thought. The mirror seems as bright as a new refector! Looks like the photo has been taken down. Try this one: An astromart ad a few months ago. Great Info. Doug, it sure brings back memories! Coast Instrument, Inc. of Long Beach, CA had no connection whatsoever to Cave Optical, although they used some of the same component suppliers, such as Willard Parks who manufactured fiberglass tubes. Coast and Cave were arch rivals. The Treckerscope mount looks nothing like a Cave Astrola. 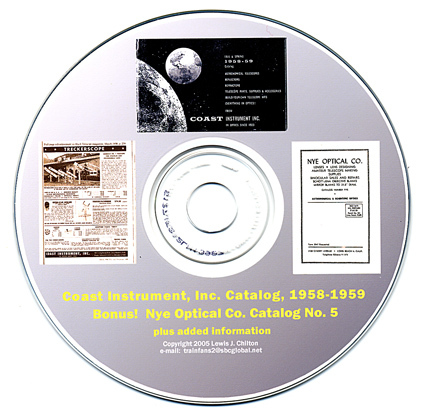 I've produced a CD on the history of Coast Instrument, if anyone is interested. It was made in response to a request by a member of the Antique Telescope Society who wanted to buy my 1958-159 Coast Instrument catalog. I wasn't interested in parting with it but agreed to copy it onto a CD. There's additional info. 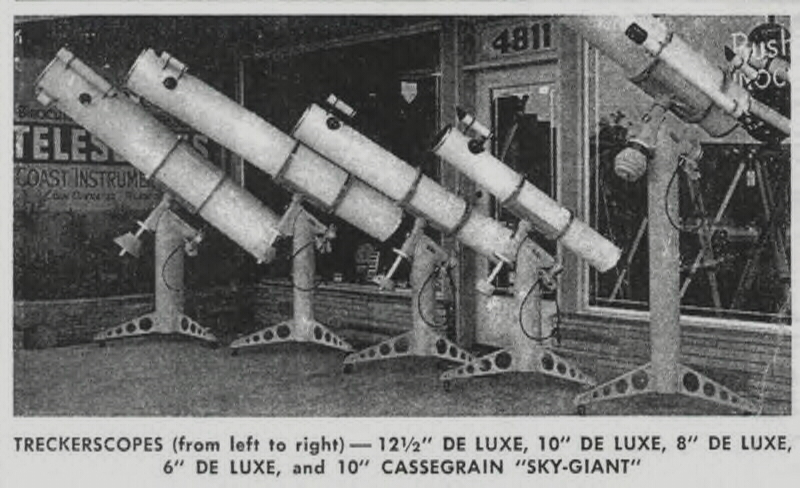 about Coast and the Treckerscopes they produced between 1956 and 1961.